Along the coast of Israel, a mere 15 minutes south of Haifa and 45 minutes north of Tel-Aviv, the caves of Nachal Me’arot, and the tel at Dor beach, provide the visitor with a time capsule of human existence from prehistoric, to ancient and modern times. 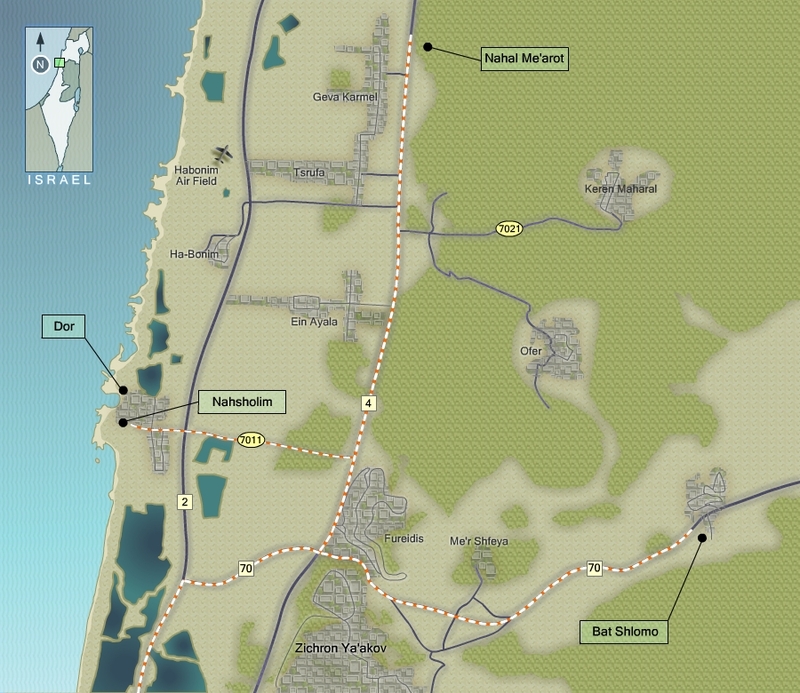 From Tel-Aviv follow Route 2 and exit at Route 70, toward Zichron Yaakov. At the Route 4 junction turn left and proceed about 13 kilometers to the entrance of the national park, which is truly one of the oldest attractions in Israel. The rocky cliffs of Mt. Carmel reveal a series of caves whose prehistoric inhabitants can be traced back about 500,000 years. Perhaps the most unique feature of these caves is that Neanderthals lived side by side with a population of modern looking human beings some 100,000 years ago. 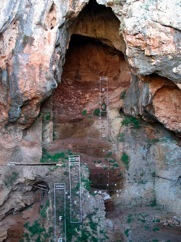 Their dwellings were in the area of what today is called the Nachal Me’arot Nature Reserve, a national park that includes a wadi with walking trails and a series of caves. Visitors who are able to climb the steep steps can explore three main caves, the first being the Tabun or Tanur cave. Here, layers of sea sand and microscopic evidence of pollen suggest to researchers that during the Paleolithic age the coast was much closer and was covered with savannah vegetation. The early cultures that used the cave are clearly identified by signage permitting the visitor to understand the sequential evolution of man living for thousand of years at this site. In fact, the earliest prehistoric inhabitants of the cave were apparently homoerectus and used a hand axe of flint or limestone for skinning and deboning animals such as rhinoceros and hippopotamus. One of the most important finds in the Tabun cave has been the Neanderthal skeletal remains of a female dating back some 120,000 years. Interestingly, at the nearby Skhul cave, an additional 14 skeletons were excavated, similar to human beings in physical appearance, leading researchers to hypothesize that Homo Sapiens did not evolve from the Neanderthals, but that both lived together contemporaneously in the Mt. Carmel area. 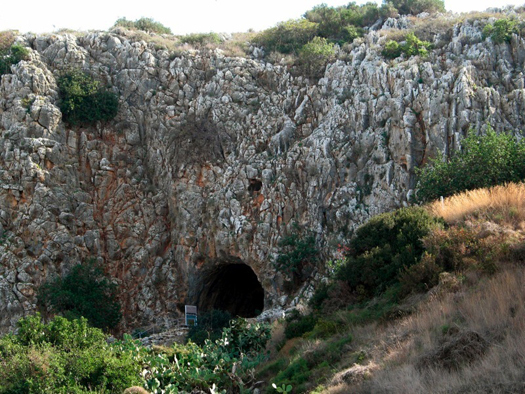 Further down the trail, you will come upon the Nahal, or El –Wad, cave where one of the most important finds has been evidence of the Natufian culture. This 10,000-year-old settlement is thought to have been permanent, with groups of families living in a village type encampment utilizing the cave perhaps for storage and the terrace in front of it for their tents. The most notable feature of this culture would have been the transition from hunter/gatherers to plant growing and animal domestication, and the evolution of crude stone tools to delicate microliths. On the terrace, archaeologists uncovered more than 100 burials with individuals lying in a tightly flexed position, a replica of which is available for viewing. Along side are several round niches carved in the stone, which may have served a cultic purpose. Visitors wishing to continue their visit at Nachal Me’arot, can follow the footsteps of prehistoric man by choosing one of several walking options, as set forth in the Israel travel guide provided at the ticket window. The circular blue route through the wadi and up the ridge will take you about two hours. On route you can observe hyraxes sunning themselves, or you can just enjoy the cliff flora, some of which are unique to Nachal Me’arot. A wooded area near the ranger station/gift shop has a picnic area, and occasionally inhabitants from the nearby Druze villages will sell pita, olives and sweets near the parking lot. As an alternative to a hike through the wadi, you may consider a walk on the nearby immaculate white sand beach at Dor. 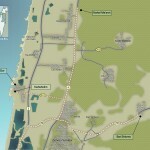 Follow Route 4 south towards Tel- Aviv, and just before reaching Zichron Yaakov and the Arab village of Fureidis, turn right at the sign leading you to Kibbutz Nachsholim and Dor. Your car can be parked within the gates of the kibbutz hotel, near the excellent museum, which exhibits many of the finds from the tel and its adjacent natural harbor. Archaeologists from the Hebrew University have excavated Tel Dor since 1980, and its remains on the shores of the Mediterranean attest to the site having been a flourishing port city throughout the millennia. In fact, the earliest remains at the tel date back to the Canaanite period ending about 1200 BCE. Later, the Shkil tribe of sea raiders inhabited Dor, as described in the letters of the Egyptian traveler Wen-Amon.The Phoenicians settled at Dor approximately 1100 BCE, and subsequently it became King Solomon’s main port on the Mediterranean. Walking among the remains overlooking the sea, it becomes evident that the Greco-Roman civilizations were also dominant at Dor. Archaeologists have excavated Roman temples and mosaic floors, as well as stone-walled houses from the Hellenistic period, when the site was known as Dora. Artifacts of beautiful Roman and Greek bowls, plates, jugs and jewelry are displayed at the nearby museum. From the 4th to the 7th century CE, Dor served as a Bishopric, but the Byzantine church was later abandoned. During the Arab period, the village of Tantura was established. Israeli forces captured this village during the War of Independence in 1948, with some of its residents moving to the nearby village of Fureidis, on Route 4. After visiting the tel you can get a feel for “living at the sea” at modern Dor by exploring the seaside hotel, Kibbutz Nachsholim or nearby Moshav Dor. However, you will no doubt be drawn to the imposing structure on the grounds of the kibbutz, which today houses the museum. The building was initially constructed in 1891 by Baron Edmund de Rothschild as glass bottle factory for his winery at nearby Zichron Yaakov. Interestingly, the manager of the factory was none other than Meir Dizengoff, who later served as Tel-Aviv’s first mayor. Unfortunately, the local sand was unsuitable for glass production, and the workers suffered from malaria, thus resulting in Rothschild’s venture becoming unprofitable. Before the factory closed its doors in 1895, sand was imported from Europe to make some outstanding colored glassware that is on display in the museum. The structure stood vacant for the next 80 years, until members of the Kibbutz rehabilitated it, turning it into a repository for the finds from Tel Dor and its harbor. Today, a large assortment of anchors, navigational tools, earthen storage jars, Greek and Roman pottery, jewelry and ancient figurines are beautifully displayed throughout the museum. Most impressive is the military equipment from Napoleon’s retreating army from nearby Acco, which was found in the harbor at Dor. Unfortunately, most tours in Israel don’t make a stop at this most interesting museum. Two large artillery pieces, one captured by Napoleon from the Turks (look for the Ottoman moon crescent and star), and the other from the Spanish army are on display, together with muskets, swords and ammunition. This ordinance was discarded at Napoleon’s orders in the Tantura harbor on the night of May 21st 1799 to make room for wounded soldiers who were to be transported back by horse and stretcher to the French base in Egypt. You may wish to call the museum (04-6390950) to confirm their visiting hours. For those of you interested in archaeology or history, this is a must-see stop on today’s Israel tour. The seaside area around Dor, which today includes the town of Zichron Yaakov, was developed in the early 20th century through the vision and generosity of Baron de Rothschild. Though the winery, and the renovated main street of Zichron require a separate visit, one can also appreciate Rothschild’s impact on the area with a visit to the nearby village of Bat Shlomo for lunch at the Schwartzmans. Returning to Route 4, turn right toward Zichron Yakov, and then left on Route 70, exiting at old Bat Shlomo to the right. The seven stone houses on the picturesque street were commissioned by Rothschild in 1899 as homes for his farmers and workers at the nearby winery. The fourth house on the right is the home of Ziv Schwartzman, a third generation cheese maker and olive grower. Travel to Israel would just not be the same without a stop at the Schwartzmans to enjoy a large variety of cheeses by either sitting in the comfortable canopied garden or inside among the family photographs, historical documents, antique furniture, tools and utensils. Check out the 200 year old Samovar and the Primus stove while Ziv weaves his tales of his grandfather’s and father’s life on the moshav. Also, if you look up at the ceiling, note the 100 year old red clay roof tiles imported by Rothschild from Marseilles, which still keep the water out and the warmth in, at the charming and rustic Schwartzman home. Please check out on of my other posts for more ideas regarding places to visit and things to do on your trip to Israel.